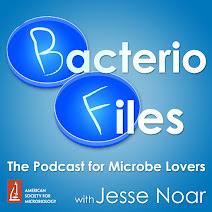 This episode: Using predatory bacteria to extract valuable bioplastics from other bacteria! Martínez V, Herencias C, Jurkevitch E, Prieto MA. 2016. Engineering a predatory bacterium as a proficient killer agent for intracellular bio-products recovery: The case of the polyhydroxyalkanoates. Sci Rep 6:24381.